The all-hay and alfalfa hay price averages both moved higher during March based on USDA’s most recent Agricultural Prices report released last week. The all-hay price was $148 per ton, up $5 per ton from the previous month and $17 higher than March 2017. Hay other than alfalfa was surprisingly down $1 per ton to $123, which is $4 per ton lower than March 2017. Market strength is coming from alfalfa. The month-to-month average alfalfa price was up $11 per ton in March to $166 per ton, which is a whopping $32 per ton more than one year ago. 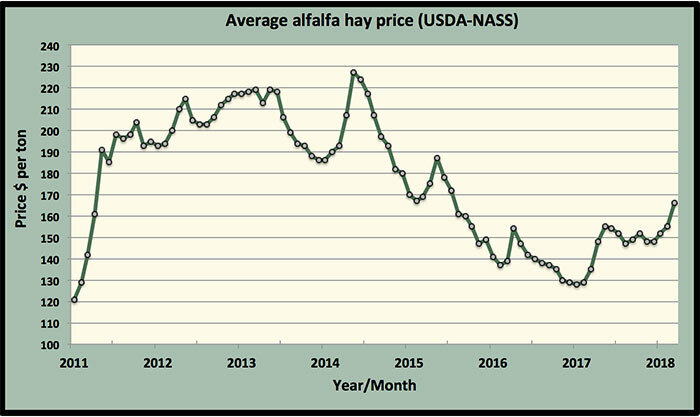 The alfalfa hay price has moved up $18 per ton since December, and the current monthly average price is the highest it’s been since July 2015. As a general rule, alfalfa prices usually don’t peak until April or May. The 2017 peak was in May at $155 per ton. 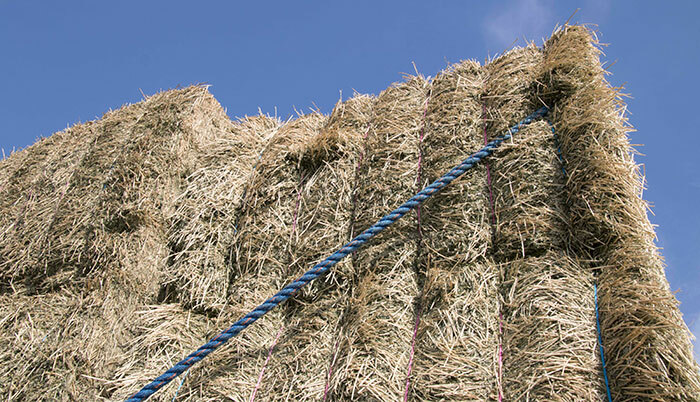 Lower December 1 hay stocks coupled with a late spring that has forced some livestock producers to seek additional hay supplies are likely contributing to the stronger hay prices. Expect the trend to continue over the next few months. It’s still a little early to know how Midwest alfalfa came through the winter. If there is significant winterkill, that could lend further strength to the market. The largest alfalfa price gainers in March were New Mexico (up $25 per ton), Ohio (up $20), Iowa (up $17), Kansas (up $14), Minnesota (up $13), Nebraska (up $12), and Pennsylvania (up $11). Only three states had price declines: New York, Michigan, and Wisconsin. The $48 per ton drop in the New York price has to be questioned; expect to see a price adjustment in next month’s report. 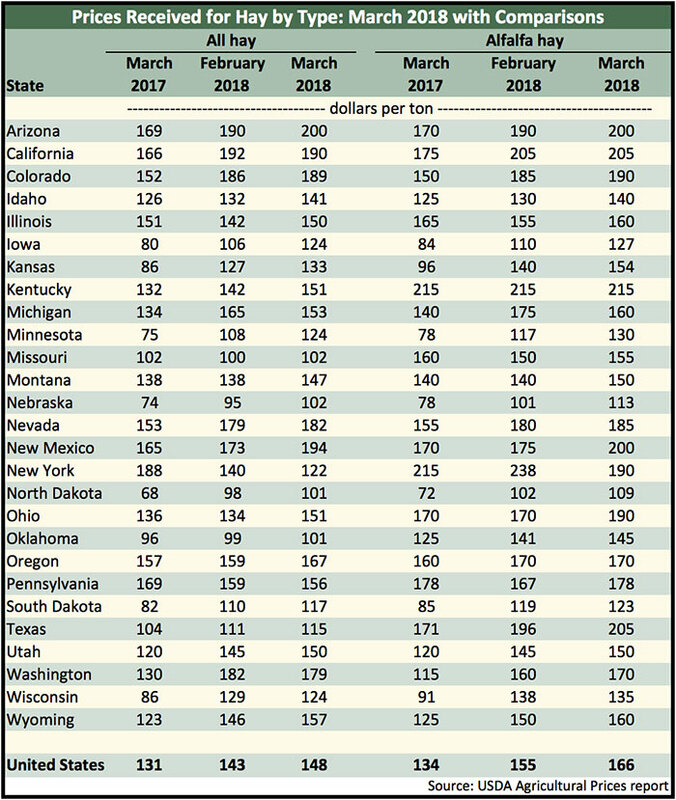 The highest alfalfa hay prices are being reported from Kentucky ($215 per ton), California ($205), Texas ($205), Arizona ($200), and New Mexico ($200). The lowest prices can be found in North Dakota ($109 per ton), Nebraska ($113), and South Dakota ($123).